I recently had a conversation with my youngest daughter about the importance of gratitude. I was wondering where I had failed as a parent because in the past few years, I’ve noticed that my girls do not say “Thank you” or send Thank you notes. It has always been an important part of my teachings as a parent and I modeled this behavior with my girls. From early on, we wrote thank you notes for gifts. I’ve always used “Please” and “Thank you” in my daily conversations. This question of where it all went, arose recently as my younger daughter had an interview with an architect for her career class. Following the interview, I asked her if she sent a thank you note. She looked at me like I had two heads saying that it wasn’t necessary. “Oh boy!’, I responded. “It is more than necessary…”. I asked whether or not it was taught in her career class and in other classes at school. She responded that it was. 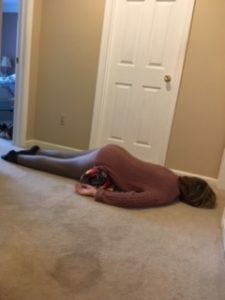 I explained the many reasons why a thank you note is necessary and hoped that she would file this away for her future personal and professional life. She did email a thank you. This interaction prompted more dialogue about the role of the thank you. So my daughter informs me that there exists a silent thank you. Awww…I wasn’t aware. I was afraid that it was in some social media post somewhere that I missed. She then demonstrated said silent thank you with a tilt of her head, a slight smile with some eye contact and a subtle nod. So different from the jerk to one side with a smirk on the face…oh and the eye rolling! I am now on the lookout for the gratitude spilling from my kids and my hope in sharing this is that you become aware of the Unspoken Thank You. Tilt, smile, eye contact and a nod. Try this meditation below for an ounce or pound of gratitude. Sit comfortably. Close your eyes and, for a few moments, focus on the gentle movement of your breath. Then begin pausing briefly after each inhalation and exhalation. As you inhale, visualize receiving the elements of your life – experiences, people who have touched you, things you are capable of – with gratitude. Pause after each reflection and take a moment to integrate and appreciate feeling fulfilled by these gifts. As you exhale, imagine sharing that sense of fulfillment with others. Pause again and imagine others – your family, community, the world at large – receiving your offering with a similar sense of gratitude. Continue this cycle – inhale/pause, exhale/pause – for several minutes, and then shift your focue back to the subtle movement of your breath before opening your eyes. Benefits: Gently stretches the spine, slight inversion to release pressure in low back, improve circulation, revitalizing while giving a bit of grounding through abdominal area and lower chakras, internal massage to organs, lengthens muscles fibers in quads. 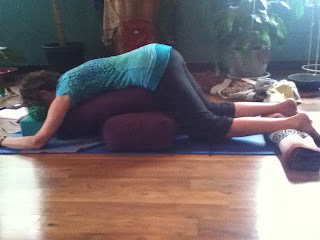 Stack one bolster on top of another vertically on your mat. Move the top bolster slightly back so that the two bolsters are staggered like stairs. 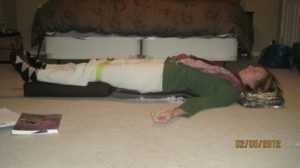 Roll one blanket for ankle support and place toward back of mat where ankles can lay across. Recline your belly over the bolsters and reach legs back until ankles rest on blanket roll. Legs will still have a small bend in the knees to keep alignment. 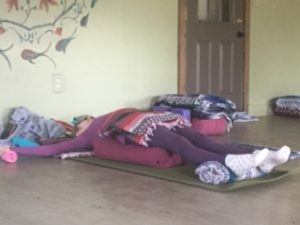 Your head hangs over so that the chin may either be resting lightly on side of top bolster or even resting forehead on a block which is placed on bottom bolster. Make sure that the neck feels long. Drape arms over sides of bolsters and let the tension drain down the arms to fingertips and out into a puddle on the floor.